You understand that you can listen to music in another person’s iTunes library if that person’s computer is on your local area network and they’ve shared their library. This we know. Suppose you could easily listen to that person’s iTunes library from anywhere in the world. Oh, and stream unprotected TV shows and movies they’ve stored in that same library. And, while you’re at it, download any of the media in that library. Download and install a copy of Mojo. During the installation process you’re asked to create a username and password. Once you’ve done so you’re free to send that username to other Mojo users (and, hopefully, receive their username in return). To add a user, choose Add Buddy from Mojo’s Roster menu. The user on the other end will accept or decline your request to be added. If accepted, that user appears in the Mojo window. 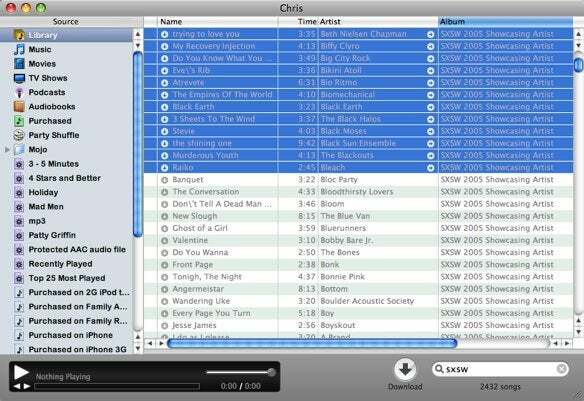 Select the user and click the Music button and the contents of the user’s iTunes library appear in a separate window. That window looks very much like the iTunes interface. Along the left side is a Source pane that includes Library, Music, Movies, TV Shows, Podcasts, Audiobooks, Purchased, and Party Shuffle entries along with a list of that user’s playlists—smart playlists as well as regular playlists. Track titles appear to the right, just as they would in iTunes. Track titles appear in one of three colors. Gray titles indicate tracks that are in your iTunes library. Black titles are tracks that aren’t in your iTunes library. Red titles are those that are protected with Apple’s FairPlay DRM. (Although you can download a track with a red title, you won’t be able to play it unless you authorize it with the owner’s Apple ID.) The number of tracks in the library or selected playlist are displayed at the bottom of the window. Just above that number is a Search field for locating specific media in that library. To stream an audio track, just select it and click Mojo’s Play button. To download a track, select it and click the Download icon next to it. You can download multiple tracks by selecting those tracks and clicking the Download button at the bottom of the window. When you download tracks they’re automatically added to your iTunes library as well as added to a playlist with the name of the source within a Mojo folder. There’s no way to tell what someone has downloaded from your library. Video works a little differently. When you stream a video it opens in QuickTime Player and begins streaming—you can watch it as it downloads. When the stream is completely downloaded you can choose to save it. Or, as with audio tracks, you can simply download it without streaming. This all works in the free version. If you pay for the Pro version ($11 for three licenses, $19 for six licenses, and $27 for nine licenses) you can add a greater number of Internet buddies as well as use the program’s playlist subscription feature. This feature allows you to subscribe to a playlist of another user. When they update that playlist, the added contents of that playlist are automatically downloaded to your Mac. In my limited testing I found that Mojo works some of the time. When queuing up a long list of tracks and a movie it downloaded a dozen tracks or so and then lost all interest in downloading any more until I relaunched the application (it doesn’t save the queue so you have to re-add tracks on relaunch). Now to the legal ramifications. When you sign up for Mojo you agree to not share copyrighted material. Whether you choose to honor this agreement (and potentially put yourself in legal jeopardy) is up to you. It’s worth bearing in mind that while much of the music at the iTunes Store is no longer copy-protected, all of it is tagged with your Apple ID. Loosely sharing that material would be too stupid for words. Is it morally supportable? Again, that’s up to you and how you use it. Its ease of use makes it very convenient for those on the road who want access to the iTunes library on their home computer. And having Mojo host a massive free library of music—say the South-by-Southwest Showcase collection that’s released every year—would be a great way to listen to just the tracks you want rather than downloading a multi-gigabyte collection of music, some of which you may not like. And it’s not as if you couldn’t do something like this using the sharing capabilities built into OS X. Mojo simply makes configuring your computer to share this material much easier.